Iowa State University is one of the nation's oldest and most respected land-grant universities. Created by the Iowa General Assembly in 1858, the Iowa Agricultural College and Model Farm was designated the nation's first land-grant college when Iowa became the first state to accept terms of the federal Morrill Act in 1864. Since 1959, the institution has been known as Iowa State University of Science and Technology. 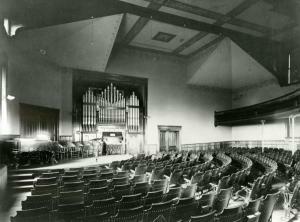 Music Hall (formerly a faculty residence) served as home to the Department from Nov. 1928 to summer 1978. Throughout the 1970s, the Music Department was housed in seven different buildings: Morrill Hall, Pope Cottage, Music Hall, Exhibit Hall, the Armory, Engineering Research Institute and Temporary Building F (a WWII wooden barracks). The current Music Hall, built in 1981, occupies the same site as its predecessor. Music has been a part of the university since its earliest years. In 1880, when Iowa State catalogs began to be printed on a regular basis, it was clear that music was a vital part of the activities at the Iowa Agricultural College. In addition to individual lessons in piano, organ or voice, students could register for chorus and harmony classes. 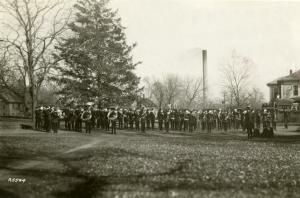 In 1888, the Music Department was formally recognized as an academic program of the university. A sight singing class had been added by that time; violin, guitar, and music theory had been added to departmental offerings by 1891; and by 1896, courses in the history of music were being taught. In 1908, the Ames Conservatory of Music was officially established as a department of the college. 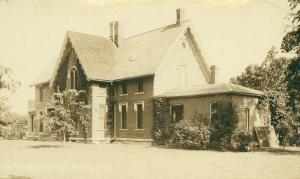 At that time, private instruction was available in voice, keyboard instruction, stringed instruments, and brass instruments; classes were taught in harmony, counterpoint, canon, fugue, analytical harmony, form, composition, and music history; ensemble experiences included chamber music, chorus and band. Also in 1908, artists' diplomas were offered in addition to teachers' certificates in music. In 1910, a course in physics of music (Physics 508) was offered and was required of all regular music students, and a "supervisor music course" was offered for those students who wished to specialize in teaching music in the public schools. Apparently, such certificates and artist's diplomas were offered through 1915. In the ensuing years, the vocal and instrumental performing organizations experienced considerable growth. Morrill Hall was used by the Music Department from 1891-1981 for faculty offices, classes, rehearsals, and performances. The 1895 Pilcher pipe organ with its fancy painted pipes saw 20 years of use for lessons, recitals and chapel services. 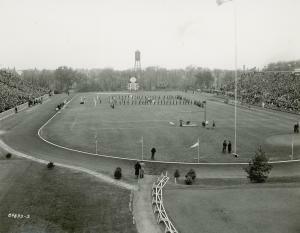 The booklet, Profiles of Iowa State University History (1968), devotes a chapter to 36 individuals who made major contributions to the shaping of the university during the first 100 years of its existence. It is significant that Tolbert MacRae (Head of the Music Department, 1920-48) is included in this influential group. 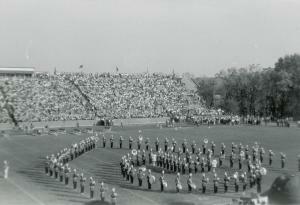 Concerts by world renowned artists had apparently been an important part of Iowa State's development from the earliest years. Some of the eminent artists brought to campus each year began to be listed in ISU General Catalog in 1916, a practice that continued through 1948 (except for the 4-year period, 1939-43). Included were such names as Sergei Rachmaninoff, Fritz Kreisler, Pablo Casals, Mischa Elmann, and Maud Powell, and symphony orchestras such as the New York Philharmonic and Minneapolis Symphony Orchestra. The tradition of enhancing the life of the university community with concerts by leading artists of the world continues today through the efforts of the ISU Performing Arts Council, Ames International Orchestra Festival, Alvin Edgar Fund for the Performing Arts, and the special attractions sponsored by the Iowa State Center. Dr. W. Robert Parks became the eleventh President of Iowa State in 1965 and focused university effort on the maturation of the humanities and social sciences. Two years later, in 1967, a student could earn a degree in music at Iowa State University for the first time. This degree, Bachelor of Science with a major in music (with options in music education and performance), was replaced by the Bachelor of Arts and Bachelor of Music degree programs in 1970. Since that time options in the music major program have included music history and literature, music education, theory-composition, and performance options in organ, piano, string instruments, voice, and wind or percussion instruments. In June 1992, the university approved an administrative move of the Theatre program from the Department of Speech Communications (which was eliminated as a department) to the Department of Music. Administrative responsibilities were divided between the Head of Music and a Professor-in-Charge of Theatre. Faculty recommended that planning for a School of Performing Arts begin and as the first step in that planning, the faculty began work on a degree in theatre. In 1996, a Bachelor of Arts in the Performing Arts (with emphases in acting/directing, design, and dance) was added to the curriculum. Today the Department of Music (including Theatre) is one of 23 academic units in the College of Liberal Arts and Sciences (LAS). The department makes a unique contribution to the college's mission to provide a rich range of program options within the context of a modern liberal arts setting. During the century in which the department functioned primarily as a service unit, instruction and performance experiences were provided for thousands of students. While this service function remains an important element even today, the department's mission also includes preparing students for a wide variety of careers in the performing arts.